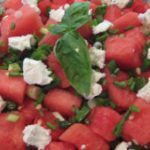 This Watermelon Salad recipe originated from Wilson Farms in Lexington, Massachusetts. It came by way of my dear friends Brett and Erin Blake. Mix watermelon, basil and scallions, place in bowl. Sprinkle with goat cheese. Garnish with basil sprigs.